Job search site Indeed has seen a 90% increase in bitcoin, crypto and blockchain job postings over the past year. The reason, according to experts: companies using the distributed ledger tech are moving from pilot programs to real-world deployments. Blockchain jobs remain hot in the U.S., though some parts of the country are hotter than others. According to new data from Austin-based job search site Indeed, there was a 90% increase in blockchain, bitcoin and cryptocurrency job postings between February 2018 and February 2019. While a more than 4,000% increase might seem epic, context is everything. For example, the number of blockchain-related job postings on Indeed in February 2017 was 12 per million; that number rose to 88.4 per million this past February. By comparison, the number of jobs for data scientists was 1,000 per million postings in February. So while blockchain postings are growing fast, the overall numbers remain behind more established IT career choices. Eileen Lowry, global program director for IBM Blockchain Labs, said the increase in job postings comes down to "basics of supply and demand." "IBM has more than 500 client projects on blockchain and growing," Lowry said. IBM is one of the top three companies in terms of blockchain job postings, according to Indeed. While cryptocurrencies and ICOs drove a lot of initial interest (and now skepticism) in blockchain, businesses becoming aware of the attributes of decentralized applications is driving the surge now, according to Lowry. Where are blockchain jobs most prevalent? Not surprisingly, in high-tech areas on both coasts, Texas, around Chicago and in Colorodao. 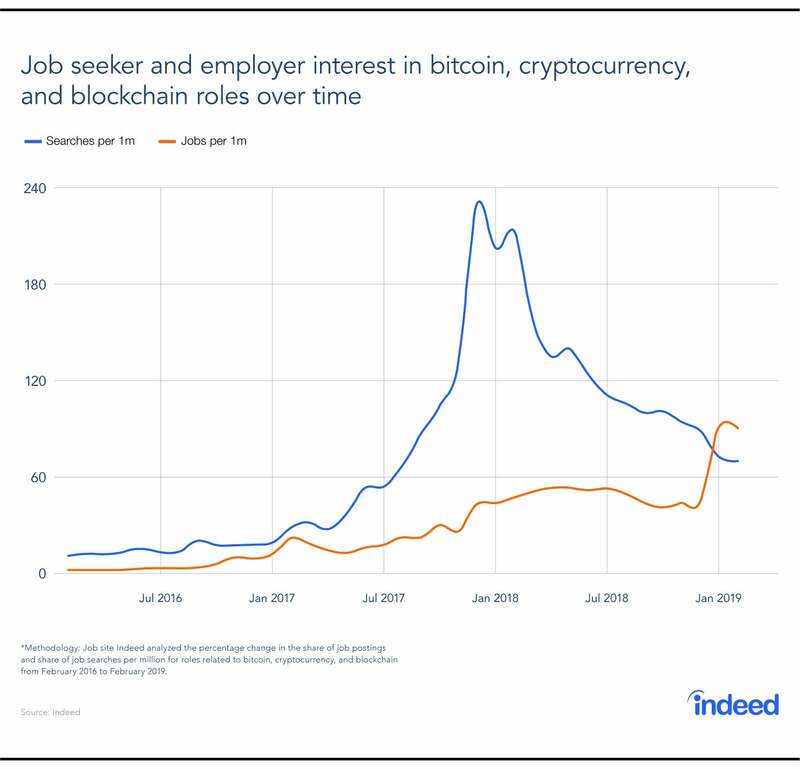 Indeed's numbers are actually lower compared to figures from other job search sites, such as LinkedIn, which reported a 33-fold increase in the number of blockchain-related job postings over the past year. On LinkedIn, "blockchain developer" is the fastest emerging job title. As blockchain jobs have grown, so have programs that train developers and others in needed blockchain skills. For example, after creating an online course on cryptocurrencies and business-scale blockchain networks, the University of California- Berkeley saw thousands of signups. The top job titles for blockchain positions are mainly for developer or engineer roles or in management or consulting roles, Flowers said. "So...blockchain engineer, blockchain developer are common job titles as well as blockchain enterprise performance consultant," Flowers said. "These positions we know...tend to have high levels of skills and education in other areas. So, I can infer from that that education expectations are high for these roles." To be well positioned to obtain a blockchain developer job, IBM's Lowry recommends starting with a broad understanding of the landscape and spectrum of blockchain protocols. Then, learn about Hyperledger Fabric, understand the components of an enterprise-grade blockchain, and how to build decentralized applications. 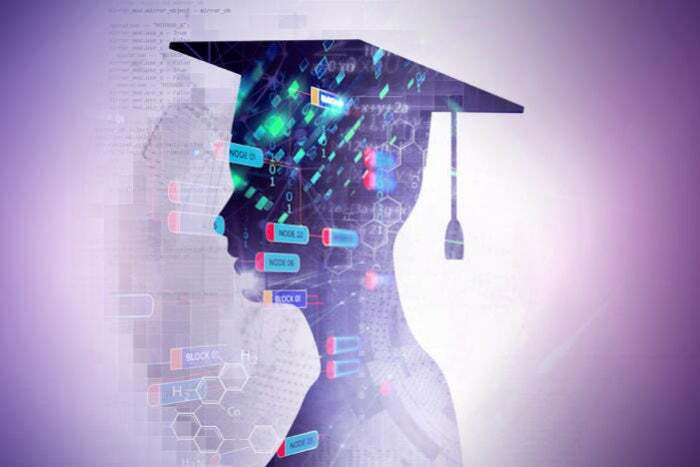 Hyperledger, Coursera, and IBM developerWorks are all resources for learning how to become a blockchain developer or engineer. Somewhat surprising to Flowers were the kinds of companies hiring blockchain experts – mainly consulting, auditing and accounting firms. "Cryptocurrency and bitcoin were started as a currency..., as a replacement for hard cash as a payment system. So, you would think originally that finance companies or investment firms, if anyone, would lead in the hiring for these roles," Flowers said. "We have job postings at all levels, from entry all the way to blockchain architect with 10 years' experience. I can't give out specific numbers, but suffice it to say [job listings] are in the double digits across all the regions," said Arun Ghosh, KPMG's US Blockchain leader. One reason for the sudden uptick in blockchain-related job postings, Ghosh said, is because enterprise projects have matured over the past three years, moving from proofs of concept in 2017 to pilots in 2018 to production systems this year. "What we're seeing now is the transition, and we ourselves are going as well from pilot to production," Ghosh said. "When you move from pilot to production, you're taking on more nodes, you're taking on more ERP systems to integrate with, you're taking on more role-based access. When you do more of those things, you obviously need more talent. "That's why we're seeing the uptick," Ghosh added. "We're seeing the same sentiment with our clients." KPMG and other enterprises in general are primarily rolling out blockchain for four business purposes, according to Ghosh. The first involves integration with existing ERP systems. For example, in the front office blockchain is being used for sales enablement and the collection of customer data shared across the distributed ledger technology (DLT). In the middle office, it's being used for supply chain tracking, regulatory operations, and procurement. And in the back office, blockchain is being used for finance functions such as accounting and cross-border trade, Ghosh said. IBM is attempting to bootstrap its blockchain cloud service through pilots such as Food Trust, a produce supply chain management system and TradeLens, an international cargo tracking system. Maersk has been testing TradeLens with 94 partner participants and Walmart is piloting Food Trust, even going as far as to tell its produce suppliers to join the network by September of this year. Blockchain is not middleware meant to tie into existing legacy systems, but there are methods for automating the flow of data from ERP systems to a distributed ledger technology. First, though, companies have to figure out if they even need it. Companies are also using blockchain to create decentralized identities for employees to allow secure access to corporate data and applications. "That's the next use of blockchain for us," Ghosh said. The third sector where blockchain is making inroads is with IoT, enabling sensors in smart buildings, manufacturing equipment or pharmaceutical packages, for example, to share data on the secure ledger. Lastly, blockchain is being used for tokenization or creating a digital representation of physical goods or products. "We're seeing loyalty tokens, and the tokenization of assets mostly inventory driven," Ghosh said. "Companies trying to put a digital wrapper around what is produced, so they can trade on it." Most experts agree, blockchain is no flash in the pan. While it may still be a nascent technology, most enterprises are exploring how it could create efficienies. Telco networks took years lay down pipes and build their infrastructure, Lowry noted. And, transactions -- blockchain's bread and butter -- have been around since the beginning of trade starting with ancient barter systems to exchanges of currency backed by commodities, such as gold and governments fiat. "We are talking about transforming transaction rails -- be it payments, supply chains, and more," Lowry said. "The systems to support the evolution of the transaction don't change overnight and last for decades. That alone gives me confidence that blockchain development is a long-term trend."